Welcome back to another show folk but without Caleb. As he is in Utah at Nerdtacular 2015 which he plans a full report on next show. Geek on Sir! Weekly Roundup: EM drive, or not to EM drive. It is a question. Then we have Win 10, being hacked by a text...granted only if you have a fear of upgrading. All the way to TWITTER banning copyrighted jokes. What do you call.... [CENSORED]. Creepy or Cool: Fake Caviar, well, your favorite food looking like caviar. Can we look at the possibility of food in forms that are not natural. Did you know: Keyboard layout and uncommon key usage. Parting Thought: AI, Robots, and some big named science people. Some folk ain't happy about them robots and just about formed a posse. Sit Back, Relax and kick your EM drive to on, wait forget that. I think we just broke a law or two. Dang. 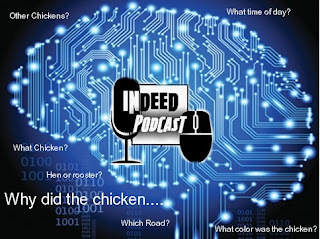 Indeed Podcast Music by PoP Overkill, Head and visit their Facebook Page.